(Nanowerk News) Researchers have developed an ultrafast light-emitting device that can flip on and off 90 billion times a second and could form the basis of optical computing. At its most basic level, your smart phone's battery is powering billions of transistors using electrons to flip on and off billions of times per second. But if microchips could use photons instead of electrons to process and transmit data, computers could operate even faster. But first engineers must build a light source that can be turned on and off that rapidly. While lasers can fit this requirement, they are too energy-hungry and unwieldy to integrate into computer chips. Duke University researchers are now one step closer to such a light source. In a new study, a team from the Pratt School of Engineering pushed semiconductor quantum dots to emit light at more than 90 billion gigahertz. This so-called plasmonic device could one day be used in optical computing chips or for optical communication between traditional electronic microchips. The study was published online on July 27 in Nature Communications ("Ultrafast Spontaneous Emission Source Using Plasmonic Nanoantennas"). "This is something that the scientific community has wanted to do for a long time," said Maiken Mikkelsen, an assistant professor of electrical and computer engineering and physics at Duke. "We can now start to think about making fast-switching devices based on this research, so there's a lot of excitement about this demonstration." The new speed record was set using plasmonics. When a laser shines on the surface of a silver cube just 75 nanometers wide, the free electrons on its surface begin to oscillate together in a wave. These oscillations create their own light, which reacts again with the free electrons. 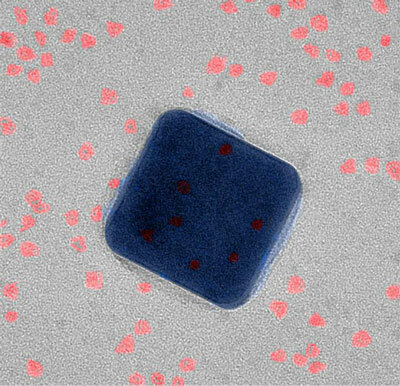 Energy trapped on the surface of the nanocube in this fashion is called a plasmon. The plasmon creates an intense electromagnetic field between the silver nanocube and a thin sheet of gold placed a mere 20 atoms away. This field interacts with quantum dots -- spheres of semiconducting material just six nanometers wide -- that are sandwiched in between the nanocube and the gold. The quantum dots, in turn, produce a directional, efficient emission of photons that can be turned on and off at more than 90 gigahertz. "There is great interest in replacing lasers with LEDs for short-distance optical communication, but these ideas have always been limited by the slow emission rate of fluorescent materials, lack of efficiency and inability to direct the photons," said Gleb Akselrod, a postdoctoral research in Mikkelsen's laboratory. "Now we have made an important step towards solving these problems." "The eventual goal is to integrate our technology into a device that can be excited either optically or electrically," said Thang Hoang, also a postdoctoral researcher in Mikkelsen's laboratory. "That's something that I think everyone, including funding agencies, is pushing pretty hard for." The group is now working to use the plasmonic structure to create a single photon source -- a necessity for extremely secure quantum communications -- by sandwiching a single quantum dot in the gap between the silver nanocube and gold foil. They are also trying to precisely place and orient the quantum dots to create the fastest fluorescence rates possible. Aside from its potential technological impacts, the research demonstrates that well-known materials need not be limited by their intrinsic properties. "By tailoring the environment around a material, like we've done here with semiconductors, we can create new designer materials with almost any optical properties we desire," said Mikkelsen. "And that's an emerging area that's fascinating to think about."